Under the Roman Emperor Hadrian (117-138 A.C.), Britannia as a figure of the province was shown on a coin for the first time. In 1672, she was minted under Charles II on the Farthing (1/4 –Penny) and on the Half Penny. Since that time, she is decorating the coins under every British monarch. On the first coins of the 17th century, she is sitting and holding a branch and a spear in her hands. Besides, a shield with the flag of Great Britain is shown. In 1797, in addition to that a sailing ship was shown in the background of the coin. That was the symbol for the British sea power. 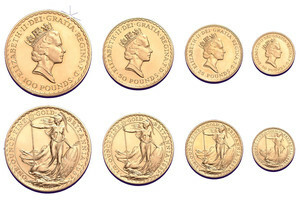 Over the years, the motive of the coin was altered. In 1821, the spear was replaced with a trident.